You need to format the disk in drive before you can use it. Hello Fiona! I can List the files. Then I press on "write"
and then it fix the sector, now it is saying that: "Boot sector" OK. "Backup Boot sector" OK. "Sectors are identical"
Then I quit and i restart de computer, but still not works. What can i try now Fiona? I don't understand why it doesn't fix it, because I can List all my files through TestDisk, thank Fiona! You've already a backup of your data. I think it'd be faster to reformat your partition and copy your data back. Please download the portable version. It's intended to check the status of your disk. If it's GOOD you can use your disk just like before. I assume that your file system is damaged or faulty? If you´d like to, you can try the last thing on your file system. You can run TestDisk / Advanced (your affected partition must be selected) / Boot and RepairFAT. It's only intended to work in conjuction with chkdsk. There might be a desription that's very dangerous, but it can help to run chkdsk. It'll only try to compare your first FAT with your second FAT (Duplicate) and if your duplicate has better results, it'll replace your first FAT. If it doesn't help, you should reformat your parttition and copy your data back. Don't forget to check your disk using CrystalDiskInfo. Thank you, many thanks to you Fiona, Thank you for your infinite patience, thank you very much Fiona, You deserve a long life, full of love, peace, health, I whish that to you Fiona! God bless you every day of your life, to you and to all your family and dear beings. I did not have obtained it without you! THANKS FOR ALL FIONA!! I love these pictures and will copy them right now! Please don't forget to check the status of your disk using CristalDiskInfo! Please use the portable version. It's pretty fast and displays the status of your disk. After loss of data, I always recommend it. I'll hope, the status of your disk is GOOD! Hello Fiona!! I used CristalDiskInfo as you said, and the status it's bad-risk, so, Now That I recover all my files in another disk, I'm formatting the disk. 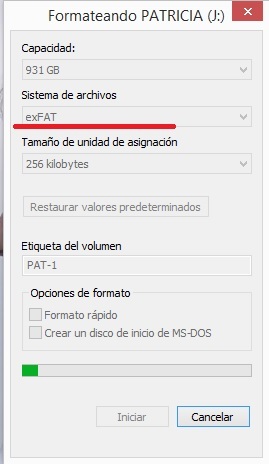 Only I have a question: the disk was FAT32 (MS-DOS) (years ago I used this disk on mac), ¿it is correct that now I format into exFAT? that will fix the disk? MILLIONS THANKS FIONA, you have saved my work, together with my job!! You are Fantastic Fiona!! The status BAD means, backing up data and disk should be replaced as soon as possible. You can reformat it and run another check using crystaldiskinfo! Also, you can determine it more accurate through running a test with hd tune free and an error scan. It's the second download and the description is "HD Tune" only. When you see any red blocks, your disk will be not reliable anymore. Exfat is a good file system but somehow still in its infancy. For example TestDisk can only write it into a partition table but can't repair the boot sector. That's why, if you don't use it on a Mac, you should consider to format your disk to NTFS. Thank you very much Fiona!!!! Wow..I find very useful information down here..may they will help me someday.